I vaguely remember as a child wondering why my mom's lemon pitcher (a clear glass pitcher with etched lemons on the exterior and a yellow plastic lid) frequently sat perched on the railing of the back deck. 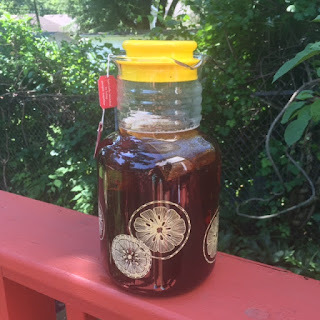 Eventually she explained the process of making sun tea and let me sample her brew; I much more clearly remember that it tasted terrible. Since living in Texas we have (slowly) developed an affection for Texas' signature beverage: TEA. 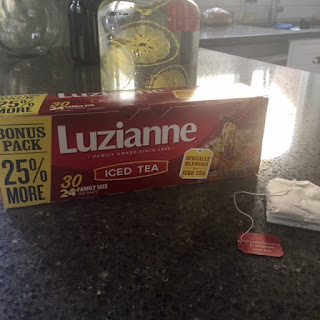 We've sampled sweet and unsweet, and while Tom, Will, Hallie, and I each have a preference for one over the other, tea in general has become quite popular with the four Ferri. 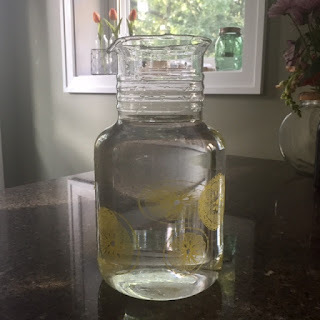 While in Wisconsin a couple of weeks ago, I asked my mom to remind me of her "recipe" so I could brew my own sun tea when we returned home. She walked me through the process, and then a few hours later... Tom, Will, and I drank tea until we had emptied the pitcher, and then I brewed a second batch. 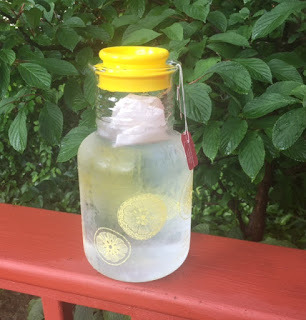 If our eagerness to drink my mom's sun tea didn't confirm our status as Texans, my still-Midwestern sister's distaste for the same drink did - she thinks tea tastes like soap. In case you'd like to try brewing your own sun tea (because after all, what else do we have around here these days but sun), here's how! Madison, but I would just use tap water here in Texas. bags are in the water and the paper tags are hanging outside the pitcher. ...and return a few hours later to enjoy! If you like tea even a little bit, I promise this sun tea will not disappoint.